This message usually is referring to the fact that Google requires you to enter the password for your alias email address as part of the setup process. Google considers outside apps (even their own applications, like Gmail) to be "less secure" if they require knowing your password. 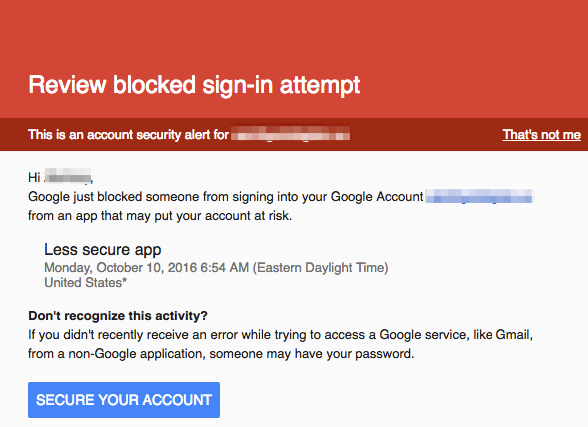 If your security settings block "less secure apps", Google will therefore block it's own application from sending the email. Update your Google security settings to allow "less secure apps." In many cases organizations have to do this anyway to enable third party apps like Apple Mail. Instead of setting up an alias, connect to this Google account directly in Mailshake to add it as it's own sending account. Read more from Google here and here.